A beautifully illustrated edition of an iconic Australian classic. One of the most famous poems in Australian literature, 'The Man from Snowy River' was first published in the Bulletin in 1890. 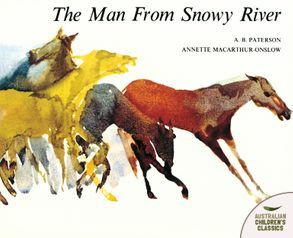 The poem famously tells the story of a chase to recapture a valuable colt, which involved riding down a steep slope to rescue the horse before the reward money was collected and the rider became a local hero. The poem was written at a time when there was a groundswell of sentiment towards Australia as a new and distinct nation apart from the British Empire, and the bush settings and characters in poems by Paterson and Henry Lawson served to emphasise the growing 'difference' in national identity. Several films, a television series and a musical have been made based on the story, proof of its enduring power to captivate Australians to this day. A. B. ‘Banjo' Paterson (1864-1941) was born near Orange in New South Wales. He worked as a lawyer's clerk before becoming a solicitor. After the publication of The Man From Snowy River and Other Verses in 1895, he became something of a celebrity, travelling widely throughout Australia. He was a war correspondent in the Boer War in South Africa, and the Boxer Rebellion in China.He later became editor of the Sydney Evening News. He is perhaps most famous for having composed the words to 'Waltzing Matilda'.